You have your ROMs (2 big chips on the top left), CIC (anti-piracy chip – on the top-right), memory mapper (bottom left square chip), and WRAM (bottom right chip). The NES reads the game off of the ROM chips by calling the data it needs from the correct memory banks. Since there aren’t enough address bits (what’s used to select memory on the ROM chips) on the NES to support all the memory on the ROMs, the memory mapper helps the NES read all of the data on the ROM’s higher addresses by managing it’s higher addressable (readable) memory. 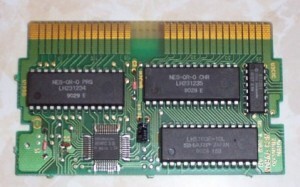 The ROM chips are just that, read-only memory ONLY. But there’s less chips! That should be simpler, right? Here we only have 2 chips; the CIC on the left (the little chip) and the ROM/Bank-switching/Logic chip on the right. 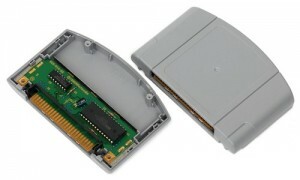 Since chip-making technology advanced greatly between the release of the NES and the N64, Nintendo was able to put more “stuff” into that one ROM chip than ever before, making boards cheaper and simpler to produce, and games harder to counterfeit. The fact that this extra “stuff” is included inside the chip, means that simply removing and replacing the chip with a another reprogrammed one (much like how NES and SNES reproductions are made) won’t work. 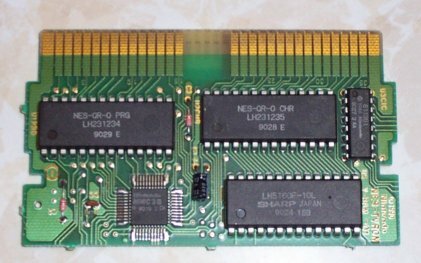 So basically, N64 reproductions won’t be possible without expensive custom boards to replicate the logic contained inside the ROM chip. This means no cheap N64 reproductions for you.